Originally created by LRCXed Larry. As I promised someone the other day, Here is a step by step of replacing or removing your carbs from a CX500 S, D, or C.
I'm showing the steps I take while installing a set. To remove them, just reverse the steps and start from the bottom up. Sorry the pictures are so dark. I didn't want to take the lights off my photo booth because I'm still working on the book. I'm installing a set of 78-79 STD. carbs here that I'm getting ready to balance and test run. I don't think I need to tell you to remove the tank. 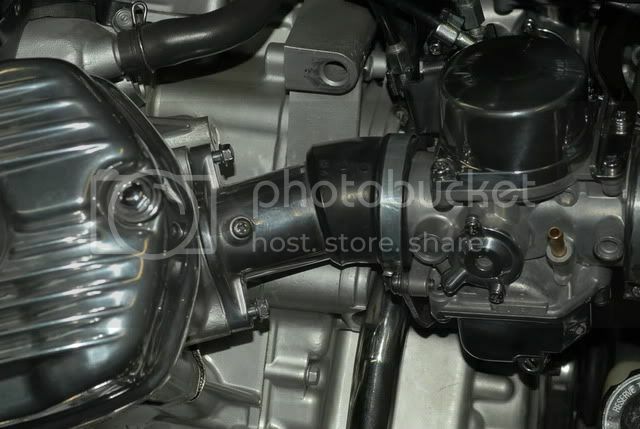 In the second picture you should notice that the upper engine mounts are removed. This makes it a little easier to get the carbs in or out. And it's much easier to reach the balance adjustment screw when it's time to adjust the balance between them. OK, the carbs are rebuilt and or ready to go. 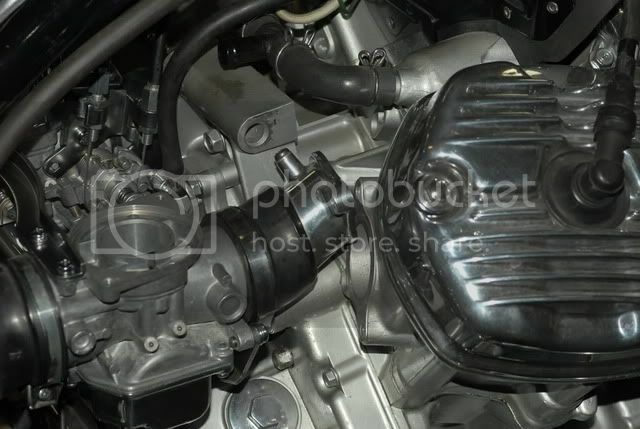 You have the new O-ring seals in the intake manifolds and your ready to install the set. 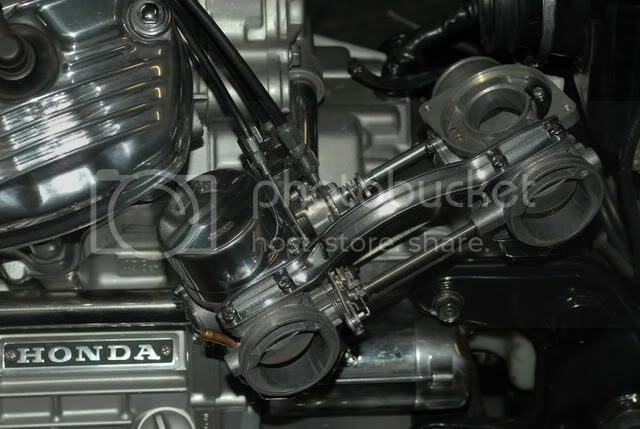 The first thing you want to do is to remove the right side cover and piston slider plus the plastic O-ring under it. 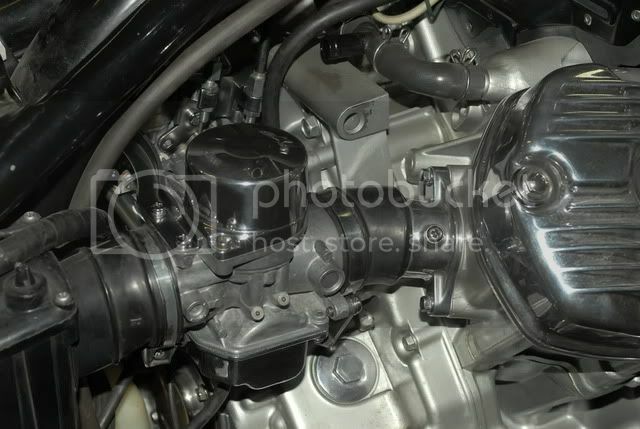 Then with the carbs out on the side of the motor, install your throttle cables and choke cable. You can adjust them from this point also. No need to try and reach inside after they are installed. After they are adjusted with about 1/8" to 1/4" throttle free play, tighten down the lock nuts on each cable. 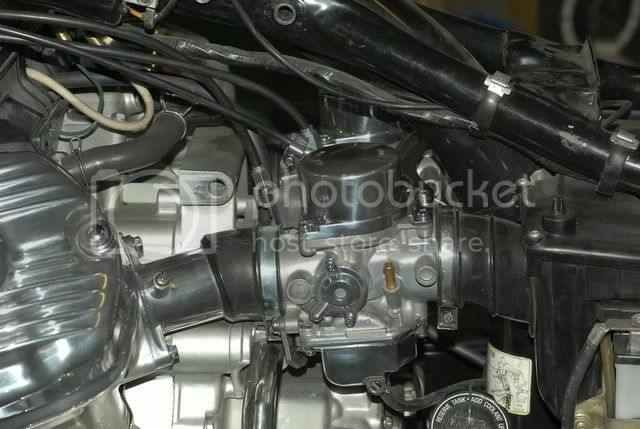 Now turn the carbs with the top twisted to the front of the motor and gently work them in between the motor and the frame tube. You might need to move the wire harness a bit, but when positioned properly, they go in smoothly. After they are in position, work them up into the air filter connections and clamp them lightly into position. Twist the throttle a few times to make sure your cables are not binding. Turn the bars all the way to the right to test this also. They seem to bind if they are not laid out right when the bike is turned to the right. The cables need to lay smoothly and not be twisted around each other, or have sharp bends in them. If it binds this is the perfect time to back out and reposition all your cables. Next make sure the O-rings are installed in the end of the manifold, clamp installed very loosely on the rubber side, and with it rotated upwards, push the manifold onto the end of the carb. I wet the inner lip a bit with some spit. I know, but it helps when these things are so tight to push on. Now rotate the manifold back down into position and insert both bolts loosely to hold it in position. Please ensure the O-ring is still in it spot and has not fallen out. I have had this happen before, and found it laying on the floor after I thought it was done. You could use contact adhesive in a few spots to hold it in too. Repeat the process on the right side same as the left. 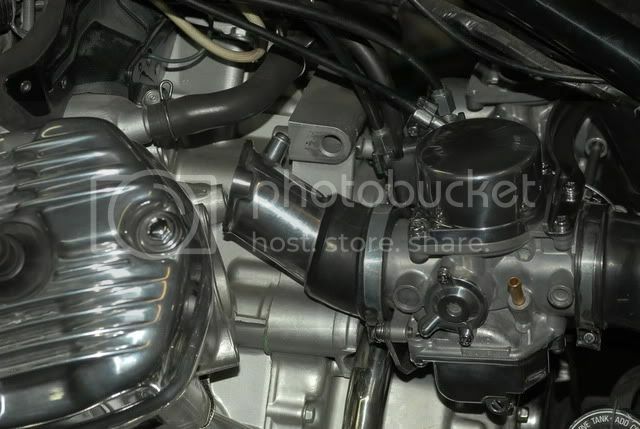 This side will be a little harder to get in because the left side is some what secured and the carb is not moving around as much. I guess you could put both on before you add the bolts if you wanted to.But when I do it this way, I know the O-ring is secured on the other side and wont fall out. Now you can tighten up the intake manifold bolts, and all for clamps on the rubbers so they are secure and sealed. 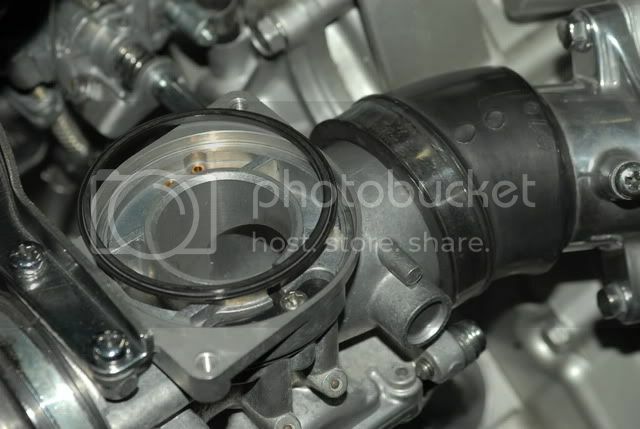 Make sure the air box fittings are lipped all the way around the intake side of the carb. They are a little hard to see some times. Use a flash light. 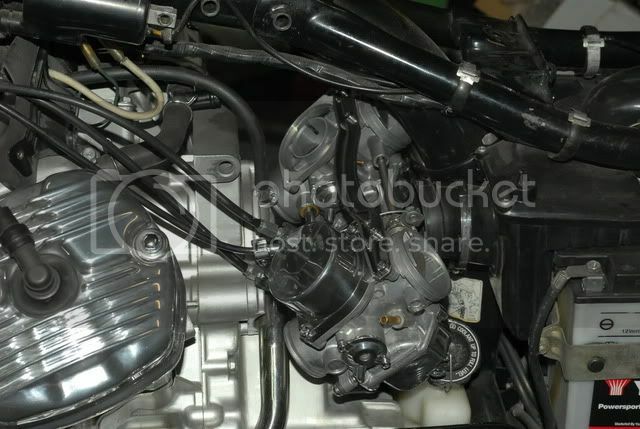 Install the plastic ring in the top of the carb, LIP FACES UP. 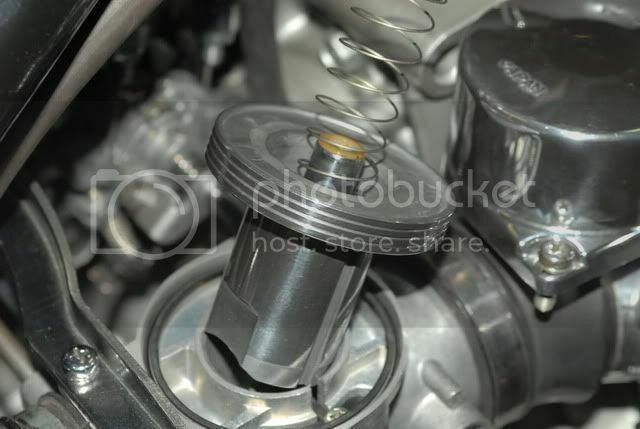 Then the piston and spring, be careful to align the slot up with the plastic guide, and be gentle with the slide needle. It should slide in easy. Secure the cover with it's 2 screws and attach the float bowl drain hoses. That's all there is to it. Even with doing the pictures at the same time it still only took me about 35 minutes. You should be able to install a set in about 15 to 20 minutes tops. They key here is to have every thing laid out and ready as you start your work. At this point I don't need to go into how to put on your tank and the fuel line. I will tell you though that you should always use a fuel filter of some kind. 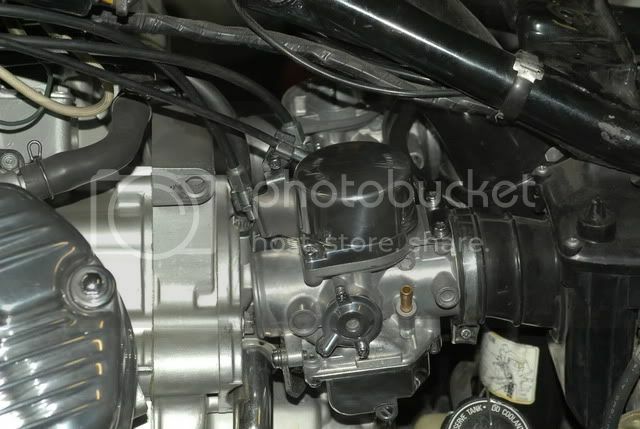 It saves a lot of frustrations when you all of a sudden end up with one side not idling or adjusting right because you allowed dirt and debris to get into a clean carb. If your carbs are not balanced yet, then this is the time to do it. Add an external tank with filter on it and do the balancing before you put on the tank. Good luck, and I hope this helps those that have never done it before. I know you said to take them off to do this in reverse but I am already backwards can you elaborate on how to get them off?